A bilingual edition of the most famous of Henri Michaux's poetry collections, now in a new translation from the French. 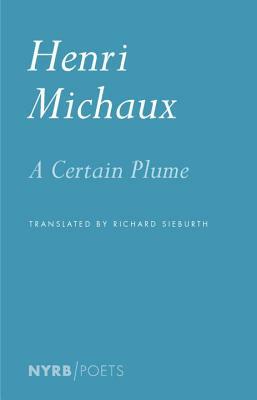 The figure of Plume preoccupied the great Belgian poet Henri Michaux throughout his career. Plume, meaning feather or pen, is a character who drifts from one thing to another, losing shape, taking new forms, at perpetual risk from reality. He is a personification of the imagination as subject to innumerable pratfalls and disgraces, and yet indestructible for all that. In this new bilingual edition, with translations by Richard Sieburth, the entire Plume cycle appears for the first time in English in the form in which Michaux originally published it. inspired his travelogues Ecuador (1929) and A Barbarian in Asia (1933), the latter soon translated by Jorge Louis Borges and Sylvia Beach. Eventually settling in Paris in the 1920s, the expatriate Michaux began to write and paint, and his work drew the attention and praise of influential critics, André Gide and Maurice Blanchot among them. In 1948 Michaux’s wife died after accidentally setting her nightgown on fire; devastated, he increasingly devoted himself to distinctive calligraphic drawings. Celebrated around the world for his accomplishments as a writer and artist, Michaux was averse to publicity and public honors and in 1965 refused the French Grand Prix National des Lettres. For many years the only photograph of himself that he allowed to circulate showed his right hand holding a pen over a sheet of paper on a chaotic writing desk. Richard Sieburth teaches at New York University. His previous versions of Henri Michaux include Emergences/Resurgences and Stroke by Stroke. He has also published translations from the French of Nostradamus, Maurice Scève, Louise Labé, Gérard de Nerval, Michel Leiris, Antonin Artaud, and Eugène Guillevic; and from the German of Oswald von Wolkenstein, Friedrich Hölderlin, Georg Büchner, Walter Benjamin, and Gershom Scholem. He has, in addition, edited a number of Ezra Pound’s works. Lawrence Durrell (1912–1990) was a British novelist and travel writer, best known for his Alexandria Quartet.